Although a Tennessee family lost their home and sentimental possessions, everyone escaped safely. Their experience should serve as a reminder to every household about the importance of fire safety. It should also serve as reinforcement to members of the fire service that public education is a life-saving mission. The house may have been devastated by a fire; however, its occupants escaped unharmed and met in a safe place outside, an action that is taught to children by firefighters. The home belonged to country singer, Trace Adkins, and his family. His three young daughters and their nanny are safe because they remembered the lessons taught by Brentwood, Tennessee firefighters at his daughters’ elementary school. The nanny and Adkins’ daughters were at home when a fire erupted in the garage area and quickly spread through the home. According to a CNN report, Adkins wife, Rhonda Adkins stated, “They ran to their safe place like we practiced, in the front yard at a big tree; and it worked. You know, fire safety is so important, and today we used it.” Ms. Adkins said she never really expected the escape plan to be needed. "But we did what those firefighters told us, and we practiced it today. It saved my kids’ lives," she said. CNN also reported that Brentwood firefighters, the same ones who were inside her home battling the flames, visited her children's elementary school to teach fire safety earlier this year. A recent fire safety education school visit by PGFD Firefighter/Medics. 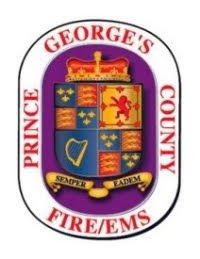 The Prince George’s County Fire/EMS Department’s Community Outreach office is available to help you schedule a visit by firefighters. Contact the Community Outreach office by calling 301-883-5250, or by emailing TACrisman@co.pg.md.us, for additional information. In the meantime, check your smoke alarms monthly and replace the batteries at least once a year; plan and practice two ways out of every room in your house; and designate a safe meeting place outside. Once safely outside, call 911 and alert dispatchers to the situation and location. 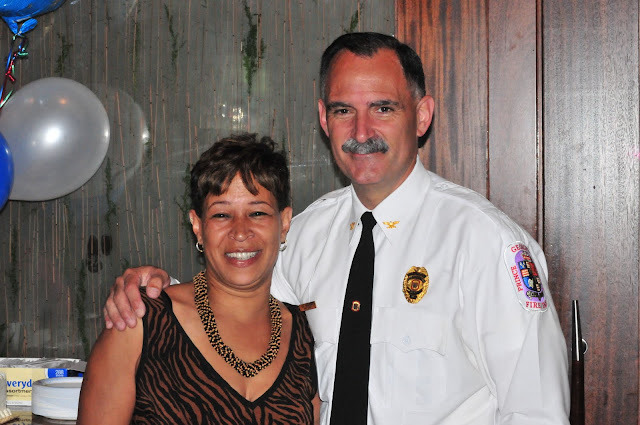 A Deputy Chief with the Prince George’s County Fire/Emergency Medical Services (EMS) Department has announced her intention to retire. Angela M. Peden, a 21 year member of the Department has stated she will retire effective July 31, 2011. She currently serves as the commander of Administrative Services which oversees the Fiscal Affairs, Logistics, Human Resources and Information Management. She previously served as the Major in charge of Fire Investigations and led the Department through two serial Arson Investigations; closing both cases with arrests. One was the DC area Arsonist and the other was the Spring Hill Lake Arsonist. As a Lieutenant Colonel of the Administrative Services Command she has led the Fire/EMS Department through the most challenging economic time in the history of the Department. She is also responsible for the implementation of ambulance transport and fire inspection fees which generate about $12 million per year for the County. Peden started her career as a firefighter in 1989 and worked at Fire/EMS Station throughout Prince George’s County working her way up the ranks to Captain in 1997. As a Captain she worked in Emergency Operations assisting in Internal Affairs. In 2003, she was promoted to a Battalion Chief and worked in Organizational Development, Human resources and served as the Fire/EMS Departments Equal Opportunity Officer. She was promoted to Major in 2004 and assigned as the commander of Fire Investigations and Prevention. Acting Fire Chief Marc S. Bashoor announced his selection to fill the vacancy created by Colonel Peden’s retirement with Benjamin Barksdale. He will join the Fire/EMS Department as a Lieutenant Colonel, Deputy Fire Chief, of one of the largest and busiest combination, volunteer and career, Fire/EMS Departments in the country. He is currently serving as an Assistant Fire Chief with the Arlington County, VA, Fire Department. Acting Lt. Col. Jerry LaMoria shares a light-hearted story about Peden when she was his rookie at Hyattsville. 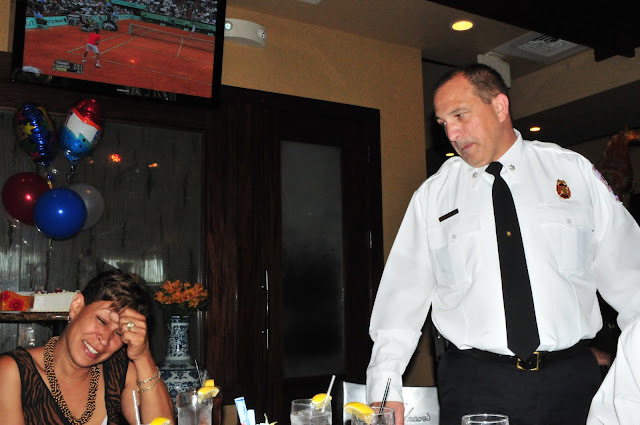 Peden and Acting Fire Chief Bashoor at a recent command staff luncheon held in her honor.